While there are plenty of books on the market about riding dirt bikes, there are few that start with the basics. Instead most books jump into how you can become the next Ricky Carmichael. But what about the parents and kids that just want to begin the sport and aren't so concerned about making a career out of it? For that Northwest rider, author and racer Tory Briggs has come up with a well-rounded primer that takes interested beginners and parents through the process of getting started. The newly released book, dirt bikes!, is just hitting stores and so far the response has been very positive from Northwest dealers. We took a moment recently to interview Tory and give you an inside look at the author. SR! 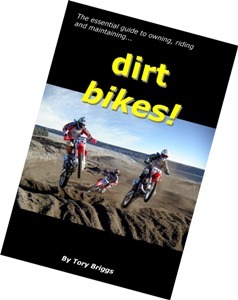 : Your new book, dirt bikes! has been in the making for awhile. What motivated you to write the book? TB: Well, the sport has been a core part of my life since Dad took it up when I was very young, and it has given so much to me, my family and my friends. Somewhere along the line, in efforts to give something back to the sport, I started writing about racing and tech tips and such. And then I wrote some pieces helping folks get started, things like picking a bike for themselves or a child, and then teaching them what they needed along with bike, and finally, unhappy with the normal way people get taught to ride, developed some specialized teaching methods. So it seems this critical mass of information accumulated in my head, and when I realized that there was no book aimed at the absolute beginner, out it came. Of course, your contacting me about the notion certainly provided focus! SR! : Who is the book aimed at? TB: dirt bikes! is aimed at newcomers to the sport, and I mean every type of beginner. In other words, it is just as valuable in helping parents introduce their children to this world as it is for a newcomer of any age. A goal I kept in mind was for an individual, with no direct support or help from anyone, to be able to take this book and come out as a well-rounded beginner with a solid foundation in every aspect of being a participant in the sport, including how to control their motorcycle. At right: The author at home. SR! : What's covered in the book? TB: Everything! What the riding opportunities are and the issues around our sport. A solid understanding of the basic components of a bike. What gear is needed and how to wear it and keep it clean. The array of associated equipment a new rider is likely to need or want; ramps, tie downs, gas cans, specialized tools and such. Thoughts on an appropriate first bike. A very structured sequence of steps focused on learning how to ride the bike, correctly, from the beginning, starting with the brakes, then special drills to master the clutch, all before ever attempting to actually ride it. Basic maintenance, how to set the bike up for your ergonomics, mix two stroke, trail etiquette, emergency repairs and so much more. I really wanted it to be comprehensive. There is also an intent to ensure the reader learns the basic lingo, and there is a glossary of those terms to help with that. TB: This book is not how to become a pro, go through the whoops like Ricky Carmichael, or do backflips like Travis Pastrana, or anything of that sort. There are plenty of books out that focus on helping a rider advance their skills, or be a racer. I don't cover jetting, or plug reading, top end rebuilds, anything that would be considered more than beginner stuff. Believe me, there is plenty to cover even with that limitation! SR! : In the book you spend several chapters getting the rider on the bike for the first time and learning how to operate the controls, eventually starting it up and going for the first ride. How is your method different from that of the MSF Dirt Bike School curriculum? TB: I have a lot of respect for the School, they do a fine job, and I always recommend to anyone that I am helping personally to go take that class. You can't get enough help getting started, this sport is challenging. I am not well enough informed about the details of their curriculum to make a direct comparison. With my method, I have responded to years of observing what goes wrong after a new rider gets rolling on a bike for the first time, and tried to address that, without omitting any of the important details that are also certainly part of the School's methods. This mostly covers two things, what people do when they panic, and a lack of truly realizing how big a factor the clutch is in precisely controlling the bike in off-road terrain. I guess teaching people to snow and water ski, and surf, and skateboard helped reinforce the panic observations, too. So, in my method, it's brakes first and foremost, rolling down a hill with the engine off, until they are completely natural with the brakes, skidding and everything, and always actuating the clutch with the brakes. And as the first thing they learn, they do seem to automatically revert to it when they panic, or just don't like what is happening. Then, I don't let them ride the bike until they master clutch feel with the walking-the-bike-around drills. Maybe I am just lazy, and got tired of students constantly stalling the bike in tight turns and while getting under way, and having to trot over to help them get going again. But I am most happy about no longer seeing the crashes induced by too much throttle, slipping back a bit, which rolls on more throttle. I love seeing them immediately pull in the clutch and begin to operate the always-covered brakes the instant they don't like what is going on. Many a friend has brought me their young and old riders, ones who have been at it for some time, just for the clutch comprehension part of my method, it really makes the connection. SR! : In terms of book signings, will you be out and about promoting the new book? TB: Absolutely! I am very excited to see it hit the streets where it can start to help people as intended. And I want to meet people that are interested in it, for I know I will receive valuable feedback, which will be incorporated via future revisions, so that dirt bikes! will continue to be the "bible" for newcomers to the sport for a long, long time. SR! : You've played a long role in the Northwest Motorcycle Association. Just what roles have you had during your time with them? TB: I started going to monthly NMA Board meetings at the end of the 80s as the club rep for Team Crutch. It was easy to see how hard a few volunteers worked at the extensive business of the NMA, where land use, legislative and legal issues account for 90% of the effort, and there are the Poker Run and Competition Series, but those are a small part of the organization's energy, although they are a key part of the branding and recognition the NMA needs among riders and businesses. Burnout was a real problem, and turnover really hurts a volunteer organization. They tend to rely on heroes so much. So I volunteered to be Secretary, and soon thereafter Ron Morgenthaler, who is the patriarch of the NMA, interviewed me regarding taking over as Editor of the newsletter, and gave me the job. He handed me free reign, and over a couple of years we grew this from a two page newsletter into a 30-50 page magazine. I essentially wrote and edited this, and took most of the pictures, for over ten years. Somewhere in there I became President, I think for six years, after being sort of shadow Prez for a couple. Then, about five years ago, I went through a major health crisis, couldn't even ride my street bike for the pain, lots of specialists and tests. It went on for months, and I had to resign both positions, I just couldn't keep it all going with family and work. But we had built a much larger staff while I was President, broke the jobs down into smaller pieces, to help with the easy burnout, and there were and are great people running the NMA then and now. Turned out to be bites from a brown recluse spider. Couldn't stay away, continued to consult the NMA even when I didn't hold an office, and as the Competition Series was in a funk a few years back, picked up those duties. Now I am Competition Director and Pointskeeper, and we are doing the first ever full-blown survey of all the off-road racers, event sponsoring clubs and others regarding the future and direction of off-road racing in Washington. Above: Up and comer Aaron Rudolph studies up for his first ride. SR! : You've ridden a lot off-road in Washington state and for many years. Many envy the fact you've been on roads that are now closed or buried. What can be done to stop the continued closure of roads and who is behind it? TB: We have to be aware of where the attacks are coming from, we have to know how to defend our opportunities and we have to have the political clout to have a chance in the battles. The NMA is the tool for all of this in Washington, from a pure dirt bike perspective. But we could never get enough political clout by ourselves, although we have had many successes, like reversing the closure of Walker Valley a few years ago. So the Washington Off Highway Vehicle Association (WOHVA), a statewide organization that brings together 4WD, Quad and others like the Rally drivers into a much more politically viable number, was formed a few years ago. They are really starting to be effective, some serious attacks on our sport have been stopped or stalled. Not that our enemies will give up, it is truly amazing to me that a group of people can hate such a wonderful, family-oriented sport as this so much as to literally dedicate their lives to eradicating off-roading from the face of the earth. Get a real life! Right now, they feel they have us on our heels in terms of opportunity on public land, and are going after shutting down riding on private land via unfair sound legislation, that is not about ensuring neighbors don't intrude on each other by making too much noise doing anything (chain saw, rock band, etc. ), but only if the noise comes from a dirt bike or quad. So, you have to be connected, in a club, the NMA, the BRC, all of them. You have to pay attention. You must respond to their calls for action, we have stopped local attacks with only a couple dozen letters! You have to realize that only a very small percentage of the population is active politically, we cannot let a very few radical anti-dirt-bike types control the agenda and the outcome. There are enough of us, if we do these simple things, to keep our opportunities to ride open, make them better, make new ones. I had better stop here, I could go on and on re-telling disasters from the past, and the trend toward more successes we have been seeing. We are actually gaining in the public land area lately. I spoke more to trail and track opportunities with the answer above. For the dual sport adventure riders, the loss of good old dirt road and two track has been an increasing bummer as well. I certainly do miss a lot of that stuff. Even if you know other ways into the areas, windfall and washout maintenance has ended. There are two issues. On private timber land, like Weyerhauser and what was Crown Pacific, you are seeing the legal department in action, avoiding liability lawsuits. On public land, you are seeing the same tight budgets that are hampering maintenance of even federal parks. And on both, you are seeing a natural response to crime control; including timber theft (go price a load of large cedar), meth labs, illegal dumping, and irresponsible firearm use. I don't know anyone who has a solution for all of this, but I do know that it can be worked out. Just look at the Puget Sound Enduro Riders and Simpson timber over in Mason County, which was similar to the great outcome between Mt. Baker M/C and the old Crown Pacific. SR! : Your whole family rides? TB: Yes indeed. My wife of 26 years, Joanne, had opportunities to ride as a child. She liked putting around on a little KDX100 I had for a pit bike when we first got together (we married six weeks after connecting, over 26 years ago), but one day it quit and she spent the rest of the weekend on a buddy's full sized bike--he had taken himself out. She has had a her own rides ever since, and won the first off-road race she entered, the Women's class at the Rimrock GP, against 14 other ladies, and she was on a KX80BW in essentially a desert race. The eldest daughter, Jessica, after a gung ho start on a battery powered ATC, and then a 50cc quad, and then a PW50, was mildly interested and trail rode casually, until her brother got a KX60. She rode it, and the racing bug bit hard, she learned basic racing concepts at the awesome Monroe Winter Indoor Flattrack Series (as did all three of our kids), and went on to win two NMA Off-Road Women's titles and a Pacific NW Arenacross championship. After a few years off of racing (but not riding) for college and career launch, she is back and winning again. She is quite the wrench too, can even do bib mousse changes. Our son, Cory, raced actively up through a 200C Off-Road championship, and after his own break from racing, is eagerly getting ready for the 2008 season. Jennifer, our youngest, hasn't won any championships yet, but has been runner up a couple times. She got the support to do the entire WORCS series in 2006, where she improved considerably, and was likely to nab second in Women's B when she cracked her wrist. That was followed by a recurring sprained ankle, so she took most of the 2007 racing season off to heal properly and strengthen. She is focused on the 2008 series too. SR! : You've been a racer for a number of years now. What's the future hold in your racing career? TB: Although I have officially announced my retirement to family and friends, I am not fooling anyone, least of all myself. The off-road community, whether it be in Washington or WORCS, is the best group of people and families anyone could ever want to hang with, to have their children grow up around. So, I just can't stay away. Seriously, I am no longer worried about season points or proving to myself that I can finish a mudbogged or dustbowl event. But a good off-road race will always be my favorite ride, even more than cutting laps with friends on the neighborhood track we built in our community. And my fellow 50+ racers, well, we've known each other a long time, and always have a great time with each other every race. I would like to apply my "freedom" from the NMA as a series to try some other races, the Qualifier in Idaho, revisit some of my favorite WORCS sites (that third place 50+B season finish in 2006 kind of epitomizes my racing career), and a few other races that tug at my interest. But as NMA Competition Director and Pointskeeper, which I will do for at least a few more years, you will find me at most of the NMA series events.